Her performances are as much disruptive as they are refined and can easily stand next to the most heavily produced club sounds. Armed with a viola, Beatrix Curran aka Battle-ax, envelops a space with relentless chains of reverb and distortion, building up cohesive, strong, and highly emotive soundscapes. Battle-ax both undermines and is reinforced by her classical training. Born in Sydney, Australia, she moved to Vienna, having first been attracted to the city’s musical history. 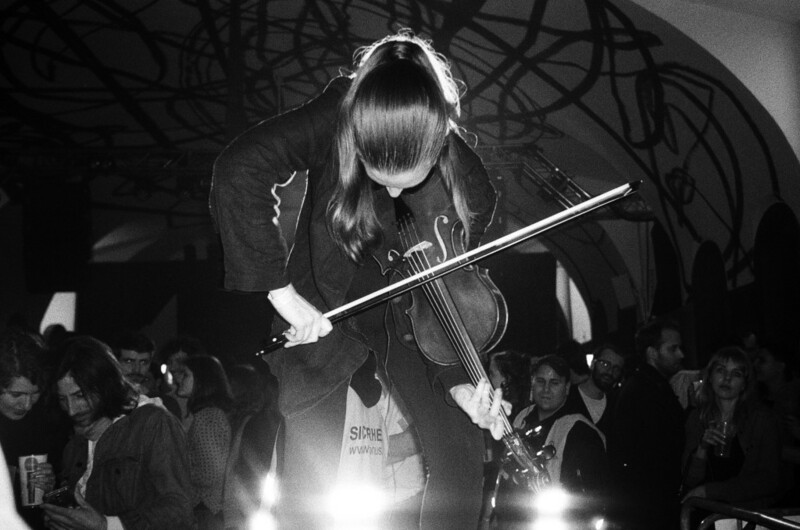 It was when she began playing in clubs however, that her improvisational style was able to brazen itself between romanticism, atonalism, and an energized repetition motivated by those alongside whom she plays at Vienna’s Bliss night, for instance Hieroglyphic Being, TCF, HVAD, and DJ Stingray. She often collaborates and performs with fellow Vienna-based producer Forever Traxx, and Berlin collective Dawn Mok. Did you come to Vienna to study the city’s musical history? I came to study art, but in the first six months I became more interested in music. I wanted to come to Europe and my lecturer suggested Vienna, and a lightbulb went off in the back of my head, thinking: “Oh Vienna, classical music”. I’d been spending a lot of time in Sydney’s rock’n’roll scene, loving it, yet knowing that I didn’t necessarily want to be in a band. Then I came here and started getting into classical music, and learning it in a completely different way. I played the violin since I was 5 and I was classically singing from a young age as well. I knew that I wanted to do music, I just had no idea what it would be. After you came to Vienna, did you get a clearer perspective? I hadn’t heard about 20th century composition until I came here. There was the Wien Modern festival, where Robert Ashley and Edgard Varèse were highlights alongside György Ligeti. I saw François Bayle perform one of his earliest pieces live. I was blown away. Yeah, I just got a completely new education, from which I was able to work my way backwards and appreciate earlier periods of music. I took a lot of classes, went to concerts, and read books for three years before I really started doing anything. But you also deconstructed it in a way. You’re also part of the club scene. The first time I played in a club I was supporting Hieroglyphic Being, and I noticed a similarity between how he structured his set and the way I would improvise, the most obvious of which had a lot to do with repetition. I began to consider my performances in this manner of developing simple themes that are repeated and altered, and can grow in any which way depending on my mood. I started listening to a lot of electronic music for the first time after that. Do you only use the viola? Yes, up until now. I’ve invited a drummer to play with me for the next concert. I think it’s natural for Battle-ax to include another musician, she’s ready to make contact. It grew from this super personal, insular relationship between myself and the instrument. I struggled with the violin when I was younger so maybe that’s why the project became so intimate, like dealing with your past. And now it’s time to move on, but you can never quite remove all the tension, haha. What do you like about the viola? The tone. I don’t like the highest string of the violin. I think it’s horrendous. I was talking with a violinist in an elevator once and she said: “You like the C-string, don’t you? (lowest string of viola). And I told her: “Yeah, and you like the E-string, don’t you? (highest string of violin)”. And she was like: “yes, I do”. The deeper tone of a viola compared to a violin is melancholic and reserved. I feel much more comfortable with those qualities than those given to the violin. I mean, a great viola solo is Stravinsky’s Elegié, whereas a great violin solo is Paganini’s Caprice No. 24. Aside from being composed more than 100 years apart, they are extremely different pieces made for very different instruments. I started with distortion, because I had no idea what I was doing. I thought that if I don’t know what I’m doing, the best thing to do is to make a lot of noise. I started out really aggressively I think, and then it tapered itself over the time. The more I play, the more interested I become in letting the natural tone of the instrument become an element to be reckoned with. What is the context of your gigs? Do you also adapt to each space/context? My shows vary from living rooms, to exhibition spaces, clubs, bars, and festivals. If I play in a club, I generally play a much shorter, louder set because I’d rather it be a burst of energy and slight break in what’s going on that night, rather than dragging it out. When playing in more controlled environments I tend to be very sensitive, giving myself time to embellish themes. The harsher moments in those situations are then less about creating energy and more about weight. Besides being associated with classical music, Vienna also has an exciting experimental / club scene nowadays. Could you talk about it? Mention any noteworthy venues, producers, labels? It’s pretty loose. Decadence is a word often ascribed to Vienna for other reasons, but it’s also relevant to its attitude towards underground music and partying. I’m really amped about performing in a few weeks at Hyperreality (a music festival part of prestigious festival Wiener Festwochen/Vienna Festival), as it’s the first large-scale event representing the city’s relationship to the current scene.